Thanks to commenter/reader Nir, I finally had the opportunity to check out for the first time the 2003 sequel to The Twilight Zone's "It's a Good Life," titled "It's Still a Good Life." The 22-minute color episode is available in its entirety (in three parts) on YouTube, starting here. Although this episode aired originally on UPN in February of 2003, there may be many of you who haven't seen the show yet. This update of my last post will definitively include spoilers, so if you want to view the episode first, go check it out and come back. My fi rst, off-the-cuff reaction is that I didn't find the episode particularly impressive. For starters, Forest Whitaker, the new series narrator, races through the opening narration like he's late for a lunch appointment. What the heck? Was he doing ten episode narrations a day or something? On the other hand, I appreciated the continuity of the narration's presentation; that the producers thought to put Whitaker in front of a map of America, as Serling stood before one in "It's a Good Life." 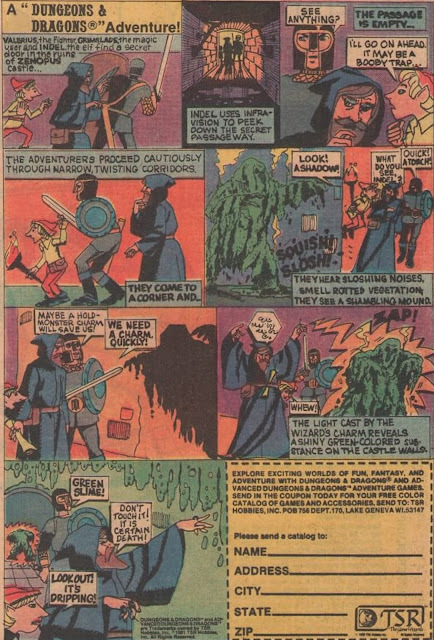 Worse than the terrible opening narration, the episode boasts almost no sense of visual distinction. Although it's wonderful to see Bill Mumy and Cloris Leachman portraying the same characters some forty years on, I wish the director of the episode, Allan Kroeker, had sought to emulate the earlier episode in terms of imagery, composition and design, at least to some small degree (other than a black-and-white fade out following the denouement). In tight, half-hour stories, less is more. We don't really need the big special effects here: people blurring and vanishing to the corn-field or, in one graphic case, Anthony causing a little boy's father to erupt into flames. "It's Still a Good Life" isn't entirely lacking in narrative interest, however. The story involves a grown Anthony (Bill Mumy) still holding Peaksville hostage to his narcissistic whims. 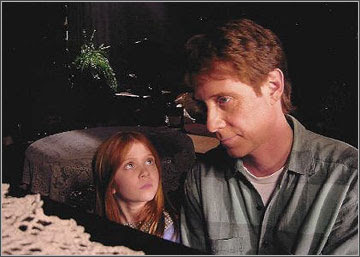 But now he has a young daughter, Audrey (Liliana Mumy), who has kept her similar powers a secret. Anthony's Mom, Agnes (Cloris Leachman) believes that Audrey can be made to turn against her father, and save the town. In addition, Audrey possesses a psychic power Anthony lacks: a creative power. She can return everyone and everything that Anthony has banished into the cornfield over the years. I felt that this was an interesting narrative development, and an effective counterpoint to Anthony's destructive abilities. In fact, if you view the end of the episode in this light, I would submit that Audrey pulls a fast-one on her Dad. She beats him at his own game by making Anthony feel, for the first time, what it's like to lonely. This is the very thing that allows Audrey to use her power and actually restore the entirety of the world. I guess some people felt that this episode featrues a downer ending, that it lets two "monsters" rule the day. I would argue the opposite. Audrey doesn't so much as join up with her Dad, as skillfully undermine him. She wishes away all of Peaksville residents so that she and her Dad are really and truly alone. When he confesses he's feeling the effects of that isolation, Audrey brings back the world. Airplanes. Cities. Communities. That's a happy ending, isn't it? Sure, if you ever see these tourists in your town, you should think only happy thoughts, but still...at least the planet and human race are restored. The wrong of four decades ago is set right, at last. So if you want to see how things turned out for Anthony and his Mom, I recommend this follow-up episode so you can get a sense of closure. However, If you are hoping that the story will be vetted with the same confidence, visual distinction and resonant imagery, you're going to be sorely disappointed by the pedestrian nature of the presentation. It strikes me as bizarre, and even a little futile, that there have been so many remakes of The Twilight Zone, and not once have these updates apparently considered that the film language of the original series -- the black-and-white, expressionist presentation -- is actually part of our pop culture bedrock. In other words, the stark, black-and-white, often-canted look of The Twilight Zone "says" Twilight Zone as much as -- if not more than -- the trademark "twist ending." To approach the franchise in color, sans expressive filmmaking techniques, just never feels fully...Twilight Zone-ish. I remember an amazing episode of Felicity several years back, almost a decade actually, in which J.J. Abrams brought in Twilight Zone director Lamont Johnson to block the actors and re-capture the visual feel of the original anthology. It was in black-and-white too. Since Leonardo Di Caprio is remaking The Twilight Zone as a feature film right now, this might be a lesson he should heed. He and Nolan just challenged today's audience with the dream imagery and logic from Inception; and should do likewise here. The Twilight Zone's presentation should be intelligent, imaginative and unconventional too. Do it in black-and-white. Do it in expressionist mode. Maybe then, we'll really and truly feel that we're...back in the zone. Last year, I finished a two-year marathon in which I watched every episode of every incarnation of The Twilight Zone to date. Though overwhelming, it was such a great experience, and I highly recommend it. As far as this particular episode goes, I enjoyed it--but I think every one of your criticisms is spot on, John. I also very much dislike Whitaker as the TZ host. So often, he runs through the scene instead of giving us a Serling-esque, pensive intro, and that always distracted and annoyed me.